Rockin’ Robin Rocks New Legendary Ladies Expansion! This Legendary Ladies expansion set rocks and it’s nearly here! Rockin’ Robin will bring her thrilling style to the new Legends expansion pack and it’ll liven up your fed! Robin is a multiple times ladies champion in several real-life promotions as well having a popular stint wrestling in Japan. She has feuded with other female wrestlers in this expansion pack such as Sherri Martel and Judy Martin. Who will be the ladies champion in YOUR fed? Hey, as a special touch you can also take out her card, play America the Beautiful in the background, and pretend she’s singing because she opened a wrestling show by singing this song! As if our sneak previews aren’t enough to convince you that you need this game pack the full roster is: Rockin’ Robin, Princess Victoria, Sherri Martel, Judy Martin, Leilani Kai, Tina Moretti, Jazz, and Nora Greenwald. Legends: Ladies Expansion is now available for preorder HERE. Also available now is a Limited Edition card for Texas Legend Johnny Mantel HERE. These items will begin shipping by the end of February so ORDER NOW! Judy Martin Enters the Fray as Legendary Ladies Game Pack is Near! Many times a tag team champion, Judy Martin is set to enter YOUR Legends promotion! The new Legendary Ladies of Wrestling pack will begin mailing in two weeks and it’ll add a whole new dimension to your game fed. Judy Martin formed a successful team winning tag gold with Leilani Kai. Will Martin have success in your promotion? Legends: Ladies Expansion is now available for preorder HERE. Also available now is a Limited Edition card for Texas Legend Johnny Mantel HERE. Nora Greenwald Will Bring Drama to Your Legends Fed! There’s more drama coming your way in the amazing Legendary Ladies of Wrestling pack that’s coming at you this month! Nora Greenwald began her career as a valet for Randy “Macho Man” Savage. That’ll create some excitement with Sherri Martel also getting a card in this pack! Add to that the fact that Nora won several Women’s Titles for several wrestling promotions and she’ll be causing all kinds of trouble in your game fed! 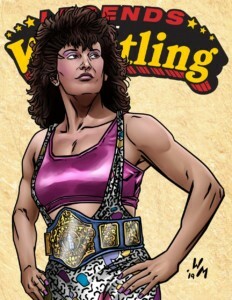 Watch for news about pre-ordering the Legendary Ladies of Wrestling pack, it’s coming soon! We’re going to make sure your Legends game promotion is never dull and Nora Greenwald will spice it up! Princess Victoria Kicks Off Legendary Ladies Card Pack! Filsinger Games is starting the new year with royalty as Princess Victoria becomes the first woman announced in the upcoming Legendary Ladies of Wrestling card pack! Princess Victoria won tag gold in two major promotions, including her first in 1984 in Calgary, Alberta, Canada. She was honored by the Cauliflower Alley Club in 2018 with a Women’s Wrestling Award. Your Legends fed is about to get a lot better and adding more variety with the Legendary Ladies of Wrestling! Get psyched. The new pack is set to start mailing on February 20. Keep watching for more announcements! More Legends from the Midwest Will Arrive in Promoter Prime Q4! Quarter 4 Promoter Prime will see an influx of talent just in time for your holiday supercards. Your Legends Color fed will never be the same! 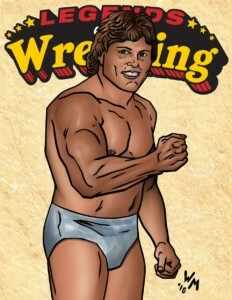 With one of the best dropkicks in wrestling history, “Jumping” Jim Brunzell will leap into Legends Color! Brunzell made his mark as a territorial wrestling star before working for a national company. This card represents his territorial days, when he challenged Nick Bockwinkel and Brusier Brody for singles titles, and Bockwinkel and Ray Stevens for tag team championships. 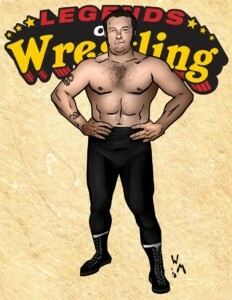 Next to get the Legends color treatment is the loveable Jake “The Milkman” Milliman. This often abused star managed to grab a few big wins in his career, much to the chagrin of Larry Zybszko. Can he get the upset again? Finally, another long time Midwest enhancement talent makes his LOW debut. Known as the “Sodbuster”, Kenny Jay was a favorite of fans throughout the Midwest for his hard work ethic and never say die attitude. That may not translate into a lot of wins, but he’ll keep you entertained! Order 2018 Legends Prime and the entire 2018 Promoter Prime set HERE. The Heenan Family Comes to the Legends Game! Widely regarded as one of the greatest managers of all time, the legendary Bobby “The Brain” Heenan as a new special edition card as part of our holiday Legends releases. 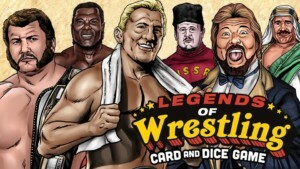 There are number of wrestlers in the Legends game that have been managed by Heenan, including the Valiants, Blackjack Mulligan, King Kong Bundy and one of the stars of Legends Expansion III Nick Bockwinkel. Who will comprise your version of the Heenan Family? 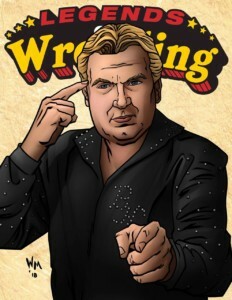 Preorder Bobby “The Brain” Heenan, Legends Expansion III and all of our holiday releases HERE! Games begin mailing December 14th. Mr. Electricity Looks to Light Up the Legends Roster! 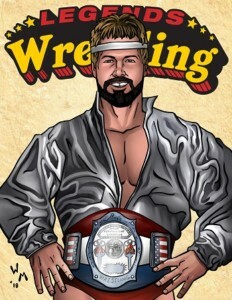 Former World Tag Team and Jr Heavyweight Champion Steve “Mr. 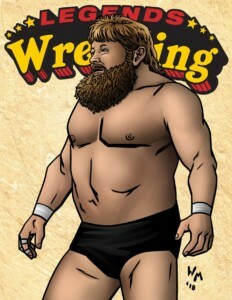 Electricity” Regal will make his Legends of Wrestling debut in Legends Expansion III. Regal was a territorial star throughout the country, hearing both cheers and jeers from wrestling fans. He once formed a team that upset the Road Warriors, can he find the right partner to catch lightning in a bottle twice? Preorder Legends Expansion III now along with all of our holiday releases HERE! Games begin mailing December 14th. Give the Smashing Gift of Our Starter Sets This Holiday! It’s going to be a Filsinger Games holiday! Are you interested in starting to play our games? GREAT IDEA! Our three most popular Starter Sets are described below along with a handy link in case you want to order. Are you thinking of giving the awesome gift of our games to a friend or family member? SUPERB! This will make you extremely popular and they’ll love you once they’re hooked! All our Starter Sets include EVERYTHING a new player will need including instructions, dice, charts, game handbook, and of course the cards! First, there’s our LEGENDS Starter Set featuring some of the all-time greats of wrestling history. This would make a great gift for a wrestling fan and especially the popular era of the 1980s. Go here! Then there’s BEST OF Starter Set for fans of indie wrestling and the current scene. Several stars that are currently active are included in this game. Go here! 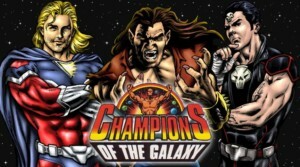 Finally there’s our flagship game, CHAMPIONS OF THE GALAXY, the game that started it all! You can’t go wrong with our cool Starter Set, it has stood the test of time! Star Warrior, Wolf, and Thantos await you! Go here! Our official holiday mascot, Santa Wolf, is feeling savage this year! It’s a perfect time to spread Filsinger Games madness this holiday season! 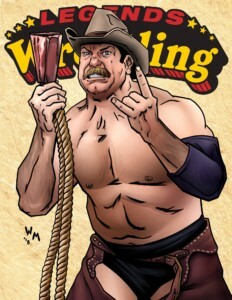 Stan Hansen to Debut in Legends Expansion III! The legendary Stan Hansen makes his LOW debut in Legends Expansion III! Hansen is an international superstar with ties to many of the current LOW roster. Will he reform his devastating tag team with Brusier Brody? Will he target former rival Nick Bockwinkel? Your promotion is about to be turned upside down!